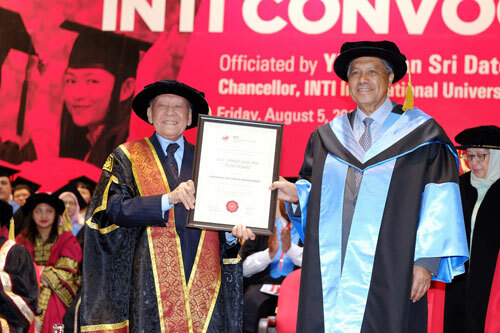 Former Chief Secretary to the Government of Malaysia, Yang Amat Berbahagia Tun Ahmad Sarji bin Abdul Hamid was conferred the very first Honorary Doctorate of Management by INTI International University in recognition of his services to the country. He was awarded the doctorate by Yang Berbahagia Tan Sri Dato’ Seri Utama Arshad Ayub, Chancellor of INTI International University (INTI) during the university’s 2016 Convocation Ceremony, which also witnessed the graduation of 360 students across INTI’s PhD, Master, Bachelor, and Diploma programmes. In his acceptance speech, Tun Ahmad Sarji, who served as the former Chairman of Permodalan Nasional Berhad (PNB) for the last 20 years and held leadership positions across a range of other impressive portfolios, expressed his gratitude for the award. He also commented on the need for students to excel in more than just academics, emphasising the importance of responsibility, accountability and team work as the drivers for their future careers and success. Further to its series of firsts, INTI was also proud to award its pioneering batch of PhD graduates with their doctorate scrolls. Arwinder Singh A/L Jigiri Singh, Federico Jr Apilado Roy, and Vahid Damideh graduated with INTI’s Doctor of Philosophy in Applied Physics award while Uchechi Cynthia Ohajionu received the award for Doctor of Philosophy (Management) By Research. This was a truly great milestone for the institution’s 30 years of academic excellence and symbolised its ongoing contribution towards the enrichment of research and development in Malaysia. 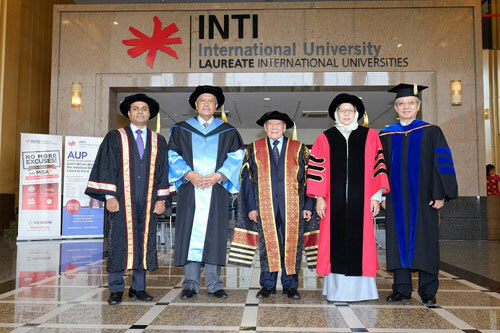 Rohit Sharma; CEO of INTI, Tun Ahmad Sarji, Tan Sri Arshad Ayub, Professor Dato Dr Rahmah Mohamed, Vice Chancellor of INTI International University, and Emeritus Professor Dr Lee Fah Onn, Co-founder & Board Member of INTI, at INTI’s 2016 Convocation Ceremony. The graduates moving forward today will join a growing community of INTI alumnae who are carving out bright futures for themselves both in life and in their careers. Since its establishment in 1986, over 55,000 individuals have gone through INTI’s rigorous academic programmes, gained insightful industry experiences during their time on campus and have paved successful careers both locally and abroad. Some of INTI’s most notable alumnae include Dato Danny Cheah; the Executive Director of the Mammoth Empire Group, Lau Seng Yee; Senior Executive Vice President of Tencent Holding Ltd and Ng Cheong Choon; the inventor of the global phenomenon: the Rainbow Loom Bands. “At INTI, we emphasise the importance for our graduates to make a difference in their work, life, family and communities. We empower them with the experiences to be innovative, creative and to stand out among their peers. These are the same admirable qualities which reflect Tun Ahmad Sarji’s extensive services to the country, and who as a role model, represents the valuable lessons gained from taking risks and living life to its fullest. We are indeed very proud to name him as our first Honorary Doctorate recipient today,” concluded Professor Dato’ Dr Rahmah.